Xi Jinping on Monday met with French PM Edouard Philippe in Beijing, saying China is willing to work with France to enrich the content of the comprehensive strategic partnership. Chinese President Xi Jinping (R) meets with French Prime Minister Edouard Philippe in Beijing, capital of China on June 25. 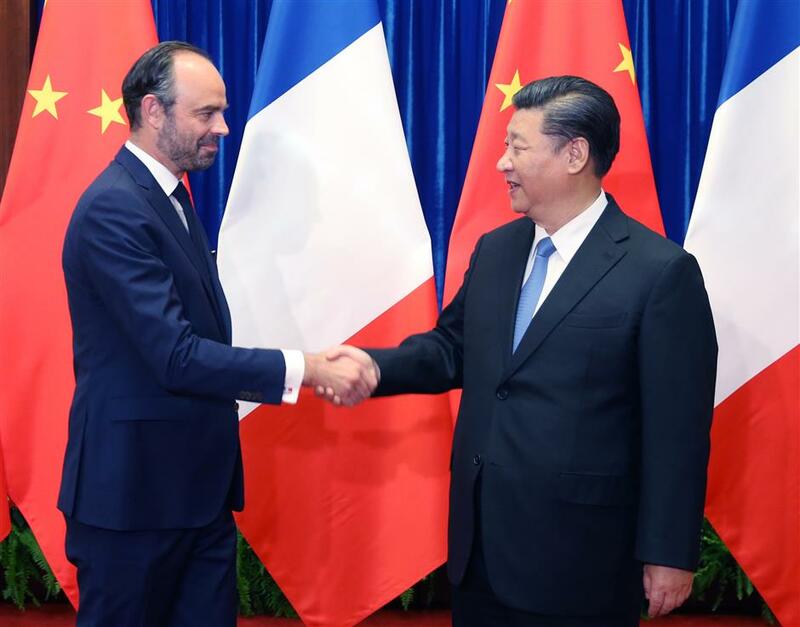 President Xi Jinping on Monday met with French Prime Minister Edouard Philippe in Beijing, saying China is willing to work with France to enrich the comprehensive strategic partnership between the two countries. At present, the world is undergoing profound and complicated changes, Xi said, adding China is ready to work with France to make bilateral relations continue to serve as a model for mutual respect, win-win cooperation, and exchanges and mutual learning between countries. Noting that both French President Emmanuel Macron and the prime minister had visited China within the last six months, Xi said it shows the high importance France attached to developing bilateral ties and the high level of the ties. "As comprehensive strategic partners, China and France need to enhance the consciousness of partnership, continue to build mutual trust and treat each other on an equal footing, and respect and accommodate each other's core interests and major concerns," Xi said. "The two countries need to make the best use of various mechanisms and platforms of dialogue and exchanges between China and France to strengthen mutual understanding and deepen mutual trust." He called on both sides to make special efforts to "boost pragmatic cooperation to implement at an early date the consensus and agreements that have been reached, give full play to the leading and exemplary role of major projects and speed up nurturing new growth points of cooperation." "China appreciates that France is willing to take an active part in the Belt and Road construction," Xi said. "China stands ready to synergize the Belt and Road Initiative with development strategies of France and the European Union in the principle of achieving shared growth through discussion and collaboration." He said both countries should "uphold the banner of multilateralism, adhere to justice and fairness, and jointly safeguard the basic norms of international relations." "China is willing to work with the European side to ensure the long-term stability of bilateral ties," Xi said. Philippe said that President Macron's successful visit to China earlier this year had once again demonstrated the importance of France-China strategic cooperation. China has both long-term planning and a down-to-earth style in development, he said, adding that China's development achievements are admirable. Full of confidence in relations with China, France hopes to boost exchanges in the areas of economy, trade and culture and promote strategic cooperation on civil nuclear energy and aerospace and aviation, Philippe said. The Belt and Road Initiative is a future-oriented vision for cooperation that is in the interest of all humanity, he added. France adheres to an independent policy in international affairs, Philippe said, noting that with multilateralism facing challenges today, it is invaluable to have a stable cooperative partner. France hopes to work with China to promote world peace and stability, and will help to strengthen cooperation between the EU and China, Philippe said. Yang Jiechi, Wang Yi and He Lifeng were present during the meeting.